First NZTA said that a Basin Reserve flyover would save 7.5 minutes on vehicle trips – and we soon showed that, even using their own methodology, six of those minutes were imaginary, or cross-claimed from other projects. Then NZTA said a Basin Reserve flyover was necessary to enable a “step change” in public transport use – and today, WCC witness Geoff Swainson admitted that the term “step change” was inappropriate, that it was at most a very gentle slope, and that modelling showed hardly any extra trips would occur as a result of a flyover being built. Today’s “justification” for building a large motorway flyover at the Basin Reserve is that it would improve the experience for pedestrians and cyclists. And next week, they’ll be saying we need to build a flyover to make our city more beautiful. Welcome to Cloud Cuckoo Land, courtesy Wellington City Council officials, the Government, and the New Zealand Transport Agency. 1) A flyover at the Basin Reserve is unnecessary. The needed transport improvements at the Basin can be achieved by ‘at grade’ changes (i.e. not above or below ground). The major bottlenecks in the system are at other places, such as the Mt Victoria tunnel and at Taranaki St – not at the Basin. 2) A flyover at the Basin would be monumentally ugly. Don’t believe the NZTA concept pictures that make it look like an elven bridge out of Lord of the Rings. Real flyovers are ugly, massive structures. The ground underneath flyovers isn’t a parkland dotted with attractive people taking their ease, as NZTA likes to portray – it’s a wasteland – and, this being Wellington, it would be a very windy wasteland. 3) Not only would a flyover be ugly, but the planned location is a critical part of Wellington. Building a flyover would destroy a lot of heritage values and ruin a central Wellington cityscape. 4) A flyover at the Basin is already budgeted to cost $90 million, and would undoubtedly cost more. It’s a waste of money. 5) Visitors to Wellington have told us repeatedly that they can’t believe a modern country is even thinking about building a flyover near the centre of its capital city. In the rest of the world – the UK, San Francisco, Seoul – flyovers are being torn down. A US expert’s testimony to the Basin Board of Inquiry echoes this point: http://www.stuff.co.nz/motoring/9723004/Basin-Reserve-flyover-idea-a-50s-relic-expert. 6) A flyover would be bad for cricket at the Basin. Even if the proposed “Northern Gateway Building” (*not* a grandstand – there would be no spectator seating there) were to be built, a flyover would still be visible, and audible, from parts of the Basin. No other international cricket ground has an elevated roadway running right next to it. Umpires, players and spectators would all hear and see a flyover. 7) The Basin Reserve has Test status from the ICC because of its historic use as a Test ground. If a flyover is built at the Basin, plus associated works, it is likely to trigger an assessment of the ground’s suitability as a Test venue by the International Cricket Council – which means, in effect, by India, Australia and England, who have seized power at the ICC. These three countries are trying to carve up the intrnational cricket cake between them. Why risk the future of the Basin, and give the ICC the chance to rule out Test cricket being played there, for the sake of an outdated, ugly flyover that doesn’t need to be built? “The Human Scale” is a Danish documentary which has been a huge success at film festivals, including a sold-out festival screening in Wellington. It includes a section on the Christchurch rebuild. Save the Basin are hosting a fundraising screening of “The Human Scale” on Saturday. How much: Recommended $10 koha at the door (no advance sales). We hope you’ll come along – and please let your friends, and anyone interested in retaining Wellington as a city for people, not a city for cars, know about this movie. Valentine’s Day gave Wellingtonians an opportunity to share why they love the Basin Reserve precinct as it is, without a flyover. 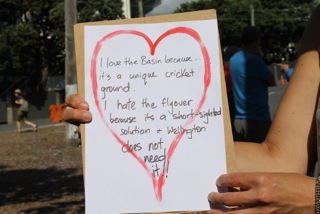 Attendees at the “Love the Basin” event wrote ‘love notes’ to the Basin Reserve and numerous passers-by waved and tooted to show their support for the cause to stop the proposed construction of a flyover at this iconic site. Save the Basin Campaign were heartened by the number of supportive people driving past Friday’s event with bus drivers, taxi drivers, private vehicle owners and even a couple of people driving Wellington City Council vans tooting to show their support for the cause. A selection of love notes written at the event are below, with the full listing posted on the Community Gallery page of Save the Basin’s website. Today is Valentine’s Day. It’s the first day of the second Test between New Zealand and India at the Basin Reserve. And today is also the day of our Love the Basin event at the Basin Reserve. Thanks for all the great work you are doing, please keep it up. I love the Basin as I ride my bike and this is is always my mellow interlude before approaching the city or the busy Adelaide Road. I often stop on the south side to west side to sit in the late evening sun. I do not want the noise or visual of the flyover. To mix sporting metaphors, cricket has become a political football. Today at the Basin, I hope to see a celebration of the game, and a celebration of the Basin Reserve. Campaigners criticising a proposed project is one thing. Politicians criticising a proposed project is another thing. But when independent transport experts find gaping flaws in the claimed benefits underlying a proposal, then that proposed project has a problem. And that’s exactly the situation with the proposed Basin Reserve flyover. A series of traffic and transportation peer review reports from consultants appointed by the Board of Inquiry has shown damning holes, inconsistencies and grossly inflated claims in NZTA’s proposals – faults that NZTA and its experts have chosen to gloss over. You can find those reports here: http://www.epa.govt.nz/Resource-management/Basin_Bridge/ReportsAdvice/Pages/default.aspx under the heading “Traffic and Transportation peer review report” towards the bottom of the page. The travel time saved by the proposed Basin Reserve flyover amounts to only 90 seconds, not the claimed seven-and-a-half minutes, a new statement by experts and witnesses shows, Labour’s MP for Wellington Central Grant Robertson says. “This flyover is costing $90 million but in the end will only save commuters 90 seconds. That is a colossal waste of money when they are other alternatives available to improve traffic flow. “The claim has been made that the flyover will give seven-and-a-half minutes of travel time savings, but in material released late last week. The experts now agree six of those minutes actually come from a third lane in the Memorial Park tunnel and changes to the Taranaki Street intersection. These are completely separate developments from the flyover. “It is significant that witnesses and experts agree on this. It puts into question the cost benefit claims about the project and should weigh heavily on the Board of Inquiry. And of course, Grant Robertson is far from the only politician to criticise the proposed flyover. In addition to Labour, the Greens, United Future, New Zealand First and Mana have all expressed opposition to the proposed flyover. All these parties recognise a crock when they see one. It’s a pity NZTA and the Government are too blinded by their own arrogance to see the fatal flaws in its proposal. The Save the Basin Campaign is calling on Wellingtonians to show their love for the Basin Reserve this Valentine’s Day, Friday 14th February, which is also with the first day of the second test match between New Zealand and India. The Save the Basin Campaign is one of a number of community groups and numerous individual citizens who are currently involved in the Board of Inquiry process to review the NZTA’s application for resource consent to build a flyover at the northern end of the Basin Reserve. A final decision is due out later in the year. The “Love the Basin” event will start at 10am and is being held at the northern end of the Basin Reserve, near the C.S. Dempster Gate. A speech and opportunity for photographs will be held at approximately 10.20am. The event will go ahead regardless of the weather and those that are unable to attend are asked to send a message stating why they love the Basin Reserve to stoptheflyover@gmail.com. The Board of Inquiry hearing into the motorway flyover the New Zealand Transport Agency is proposing to build at the Basin Reserve cricket ground in central Wellington begins today, Monday 3 February, and is scheduled to last for two months. However, Tim Jones said that the Board of Inquiry process, run by the Environmental Protection Authority (EPA) and set up by the current Government to push through resource consent applications for projects it favours within a nine-month time frame, has many flaws. We hope you’ll turn up to show your love for the Basin Reserve on Valentine’s Day, 14 February, at 10am, but there’s another opportunity to help Save the Basin later this month – and watch an award-winnng film while you do so. Save the Basin are hosting a fundraising screening of “The Human Scale” this month. This is your chance to help us pay for for our legal and publicity to oppose NZTA’s planned flyover – a project which would stand in absolute contradiction to everything “The Human Scale” is about.